Market watch The motorsport-derived E30 M3 is now one of the most sought-after classic BMWs, with a price tag to match, as Guy Baker explains. Regarded as being among the most desirable sports coupés money can buy, road-going versions of BMW’s manual E30 M3 DTM race car are lightweight, wonderfully communicative and boast a bespoke four-cylinder S14 engine that’s based on the M88 six-cylinder M1 supercar powerplant. Better still, the rear-wheel drive E30 is a treat on track. A proper factory production race car, but BMW’s rival to the Mercedes 190E was only ever produced in LHD coupé and convertible forms. The DTM race car arrived in 1985, but motoring enthusiasts had to wait until 1987 to get their hands on the road car and, in spite of its LHD set-up, the E30 was offered for sale in right-hand-drive markets such as the UK and Japan. The initial UK list price was £22,750. Group A Touring Car rules required participating cars to share key components with a road car, of which at least 5,000 variants had been produced. To allow for wider racing tyres, the wheel arches had extensions, while a higher boot lid improved aerodynamics. That boot lid alteration necessitated a change to the angle of the rear window which, together with the windscreen, was bonded to the bodyshell to increase rigidity. 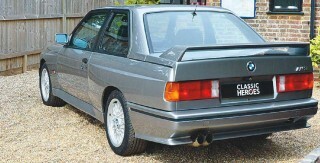 Most body panels were unique to this M3 – the only parts shared with the rest of the E30 range were the bonnet, roof and door panels. 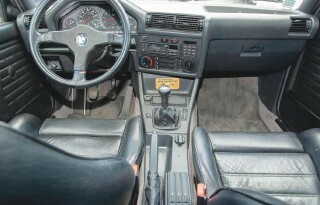 The interior was closer to its lesser siblings, with a unique M steering wheel and gear knob, an M3-specific instrument cluster and a more deeply contoured rear seat being the only major changes. The car proved so popular that production ran until 1992, with worldwide sales topping 17,000. European models were fitted with a dogleg Getrag five-speed manual gearbox, plus a rear limited-slip diff’ and a MacPherson coil and strut front suspension, with a rear semi-trailing arm set-up. The original BMW Motorsport 2.3-litre four-pot engine produced 212hp, giving the M3 a 0-62mph time of 6.6 seconds, but various enhanced, limited-edition evolutions soon followed. These included the 200hp 1987 M3 Evolution I (just 505 units) with a revised cylinder head to accommodate motorsport requirements, the 1987 Tour de Corse (40 examples for the French market only), the 1988 M3 Evolution II (501 units) with 220hp, larger wheels, thinner side and rear glass, a lighter boot lid, a larger rear spoiler and a deeper front splitter. There was also the 1988 M3 Europameister (148 units) built to celebrate the M3’s dominance of the 1988 Touring Car season, the 1989 215hp M3 Cecotto (480 units), named after BMW’s racing driver Johnny Cecotto and the 1989 M3 Roberto Ravaglia – a UK-only, 25-car limited edition to celebrate Roberto Ravaglia’s success in the BTCC. But the most soughtafter evolution has to be the 1989- 1990 M3 Sport Evolution a homologation special based on the Evo II. Power rose to 238hp, with an engine-capacity increase to 2.5 litres. Other changes included enlarged valves and a more aggressive camshaft. Wider front wings were fitted, plus adjustable front and rear spoilers and, in the interests of weight saving, options like electric windows and air-conditioning were deleted. Just 600 examples were made. With the passage of time, that limited UK supply has seen values rise sharply. 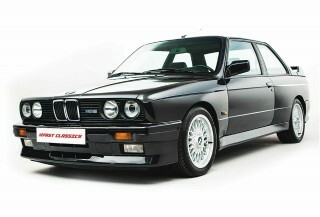 “The E30 M3 is one of the BMWs that has really benefitted from the recent growth in values of cars of this type. A few years ago, good examples cost around £10,000 – today, that same car is probably worth £40,000- £50,000,” confirms Robert Redman, forecast editor at trade experts Glass’s. “Condition, originality and provenance are key, with age and mileage largely unimportant,” he added. “And while a typical example will cost around £45,000, the better examples will be closer to £70,000.” Although a particularly rare edition, such as the Tour de Corse will cost twice that, if you can find one. If you like your classic cars to stand out, then the 1990 Alpine White 134,000-mile £52,500 example, at Essex dealer Mantis Prestige Cars (mantiscars.co.uk), could be the M3 for you. Prepared by Oakley Design, it comes with post-production Evolution sport additions, including high-back Charcoal Black Recaros, Alcantara steering wheel, handbrake and gear knob plus the original log book, service wallet, Pioneer stereo guide and a pile of old MoTs and receipts. Limited editions go for even more, though, like this immaculate 1987 Tourenwagen Europameister I spotted for sale at Classic Heroes (classicheroes. co.uk). The asking price is £65,000, and this car has had only three owners from new and covered just 64,000 miles. Having been garaged and in professional storage since 1993, the shell has no corrosion and has never required welding or new panels. The car comes with all the original tools, leather service wallet, handbooks, manuals, a fully stamped service book and a document file dating back to 1989. Hunt around, however, and you can still unearth good examples for well under £50,000 – like this 1987 Diamond Black BMW E30 M3 advertised for £45,995 at Horsham-based Fast Classics (fast-classics. com). With 77,562 on the clock, this car was originally supplied to Japan, and was imported to the UK early in 2018. As well as a comprehensive history file, this car comes with the original manuals, service book and two folders of old invoices. Well made, the E30 M3 is relatively easy to keep in good health – but needs regular fettling. Cars that have regularly been on track should be fine but watch out for any rust issues – check everywhere, including under covers, floors and box sections as well as around windows and the engine mounts. Other potential issues include accident damage, broken/worn interior trim, failed electrics, worn rear shock absorber mounts, subframe bushes and worn tie-rod ends, failed steering pumps, oil leaks, recalcitrant gearboxes, blown head gaskets and noisy diffs. The cam chain needs changing every 100,000 miles. Limited edition E30 M3s always sell for more, like this superb 1987 Touren-wagen Europameister at Classic Heroes, with a price tag of £65,000. All E30 M3s were left-hand-drive, but that hasn’t stopped the model becoming extremely desirable here in the UK. This immaculate-looking 1987 Diamond Black BMW E30 M3 is an import from Japan, and is available for £45,995 at Horsham-based Fast Classics.